Initial Reconnaissance of the Solar System’s Third Zone. This is part of a blog series on the Pluto Science Conference, “The Pluto System on the Eve of Exploration by New Horizons: Perspectives and Predictions,” held July 22-26, 2013 in Laurel, MD. 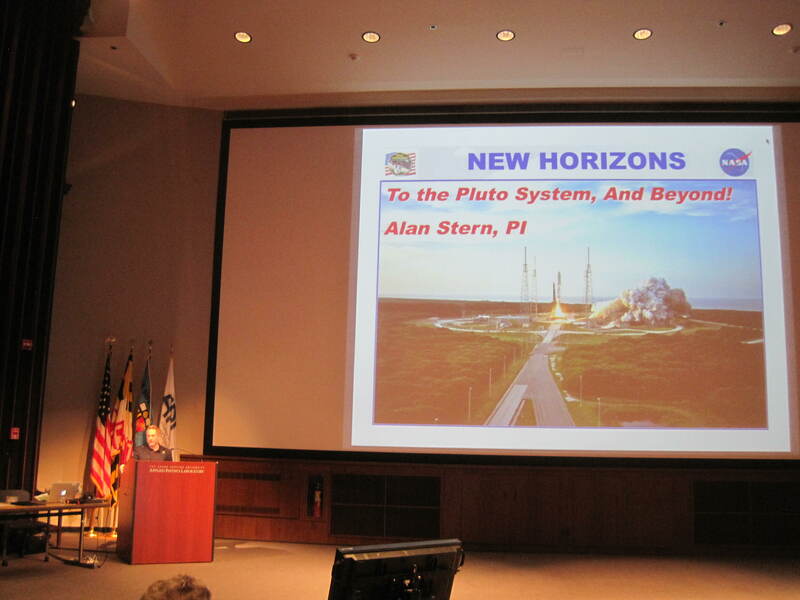 New Horizons’ Principal Inv estigator (lead scientist) is Dr Alan Stern (SwRI/Southwest Research Institute). In his presentation, he gave an overview of the mission concept, the science objectives and mission status. The scientific suite is sophisticated and carries the first student-built deep space instrument. The cruise period spans two Presidential administrations (8 years). New Horizons launched on January 19, 2006, and will fly by the Pluto system with closest approach July 14, 2015. For more information about the mission, do check out the New Horizons Mission Websites: http://pluto.jhuapl.edu/ (JHU APL site) and https://www.nasa.gov/mission_pages/newhorizons/main/index.html. (NASA site). 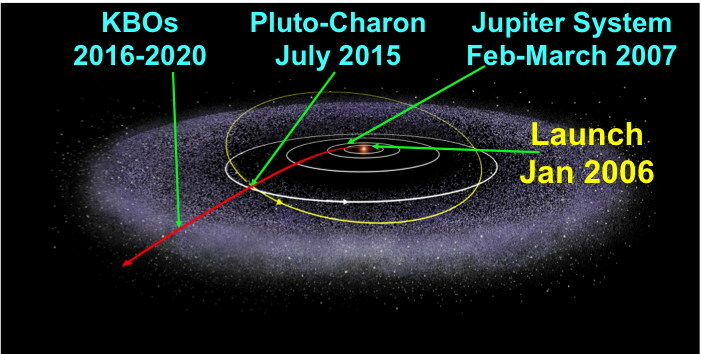 At a glance, the New Horizons Mission to Pluto and Beyond. Key milestone dates and the spacecraft trajectory (in red). Measurement-wise, New Horizons’ Pluto fly-by of July 2015 is comparable to Voyager 2’s fly-by of Neptune’s moon Triton in 1989. However, Voyager 2 did not have an infrared mapping nor ultraviolet imaging spectrometer, something New Horizons will have. Also, New Horizons will be flying three times closer to Pluto than Voyager 2 did at Triton. A snapshot of the comparison highlights from Alan’s talk is below. Comparison of Voyager 2 data from its fly-by of Neptune’s moon Triton in August 1989, with a “visualization” of what New Horizons’ best resolution at Pluto might reveal during its fly-by of Pluto in July 2015. The New Horizons’ unique science encounter involves more than 6 months of active science operations, starting in mid-April 2015 when the on-board instrument suite achieves resolution better than Hubble. A more in depth discussion about “When will New Horizons have better views of Pluto than Hubble does?” can be found in this blog entry on the Planetary Society’s blog site at http://www.planetary.org/blogs/emily-lakdawalla/2013/0218-new-horizons-pluto-better-hubble.html . To end this posting, a few fun factoids about New Horizon’s Speedy Performance since Launch. New Horizons’ Speed Record. Launched on an Atlas V-551 on January 19, 2006 at 14:00 EST, the ~400 kg spacecraft, about the size of a grand-piano, needs to travel 5 billion km (5x10e9 km) from Earth before it can execute the observations for its prime science mission. Launching with a speed of 58,000 km/hr (36,000 mph) and benefiting from a gravity-assist from Jupiter in February 2007 (which boosted the spacecraft speed), New Horizons will reach its destination, Pluto, after ~9.5 years of space flight. On the slide comparing the Pluto system encounter to the Voyager 2 fly-by of Neptune, what did Alan mean by “No Dwarf Brown Dwarf”? 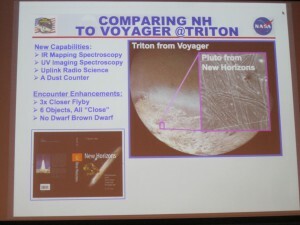 It was in context to the Voyager flyby of Triton, which was what Alan was making a comparison to, re: what New Horizons’s Pluto fly by would look like. And he was making a joke at the near-by Neptune, calling it a dwarf brown dwarf, tongue-in-check to the new classification of Pluto. What I do need to look up is whether in the 1970s up to the 1989 Triton fly-by whether there was a discussion among theorists regarding the nature of Neptune. I love this blog! Its my son’s dream to be an astronaut, he’s 4, we are constant visitors. We watch Apollo 13 nightly lol – Just wanted to stop by and say thanks for always posting great stuff! Previous Previous post: New Horizons, a mission for the patient (and persistent). Next Next post: The Architecture of New Horizons’ Pluto Fly-By Sequence.